Child welfare agencies have slammed a leaked government proposal to provide cosmetic implants for new born babies, describing it as a ‘disgrace’ and a ‘violation of human rights’. Under the proposal parents will be able to have any newborn babies fitted with lifelong-lasting tinted contact lenses. 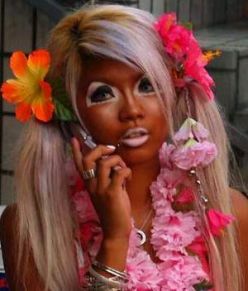 The Government plan to introduce the initiative from next January in a bid to counter the growing concerns over so-called ‘fake tan’ products – the idea being that the tinted lenses will eradicate the desire among young people to use harmful tanning products as the lenses would make everyone appear to have a ‘tanned’ complexion.